Full Blast. 1623042, 53 lb. son of Pennstar, has won the 2015 Grand National Grouse Championship. 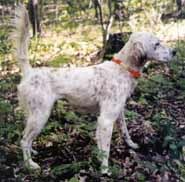 Even before his win of the ultimate championship, Full Blast stands as the only bird dog in history to win the top Cover Dog Setter Awards as a derby (Flanagan) and all-age (Seminatore) as well as the Purina Top Cover Dog Award (for all breeds) as a derby and all-age. “Jeb” started at a young age to hunt hard and handle wild birds. He proved this in numerous trials and was declared the top derby in 2013 by a wide margin. Early on “Jeb” showed a strong desire to stand birds after he found them. This made getting him finished on game a smooth process completed at a young age. 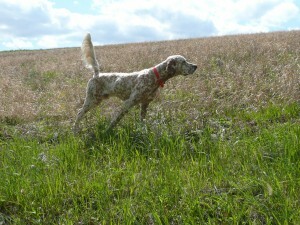 Early breaking is a trait that all bird dog breeds can benefit from and something we now see in “Jeb’s” pups. As an all-age, “Jeb” was quickly in the money. 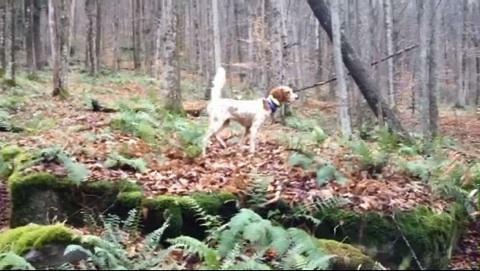 At the Michigan Woodcock Championship in the fall of 2014, “Jeb” had three woodcock finds and a grouse find at pickup in his hour of hunting to be named Champion. This was all done on a sunny, 76-degree afternoon. Strong throughout his hour, he ran an attractive, smooth flowing hunting effort. From Michigan, “Jeb” went to his home state and was named Runner-Up Champion at the prestigious Pennsylvania Grouse Championship held over the spacious grounds at Marienville, PA. 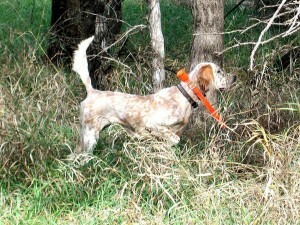 In this stake, “Jeb” again ran in the drought and heat and scored a grouse find at 59 minutes to secure this win. 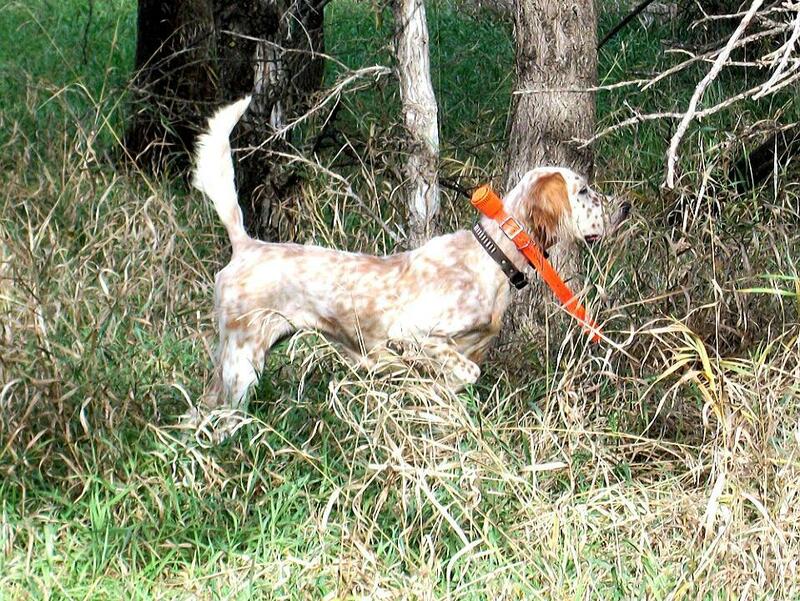 Being able to run and find birds in heat with little water is a trait that is becoming more important as bird dogs are asked to perform under tough conditions. In the spring of 2014, “Jeb” returned to the challenging Marienville grounds to be declared the winner of the Ontario Grouse Championship with a stylish grouse find in the closing minute of the hour effort. Again, “Jeb” proved that he can sustain his vigor and hunting concentration throughout a long hard hunting performance. 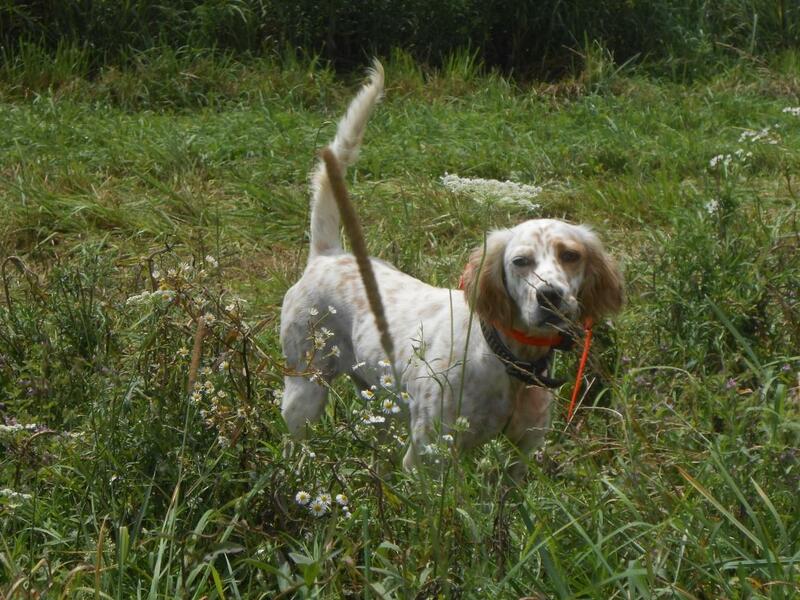 Not only has “Jeb” proven himself on wild birds but in two walking shooting dog stakes “Jeb” showed that he can adjust to these different venues and look good handling quail. He won the 30-dog entry Lost Pond Open Walking Shooting Dog in late spring 2013 in New York. Then he opened up the fall 2013 season with another 1st place at the DuBois Open Walking Shooting Dog over a field of 44 entrants. While we do not regularly campaign our dogs on quail, proof of being able to run in this type of trial adds to the versatility and character of a dog. All of “Jeb’s” Championship wins came with his trainer, pro Dave Hughes, at the helm. Full Blast is sired by 5X wildbird Champion Pennstar. Pennstar (deceased), 30-74-412 has produced Champions and important winners all across the cover dog geographic spectrum. 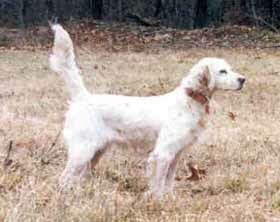 Grand National Grouse Ch. Full Tilt is also one of his offspring. Pennstar’s place among the greatest coverdog performers and producers is secure. As a performer and producer, Pennstar became known for not only being a fast and furious hunter who could dig up wild birds, but also for doing it with athleticism, jump in his step and crack in his tail. Pennstar, like his son Full Blast, pointed with straight up style. We are thrilled to have an excellent son of Pennstar to carry on this line. Pennstar is the product of breeding 3X wild bird Ch. 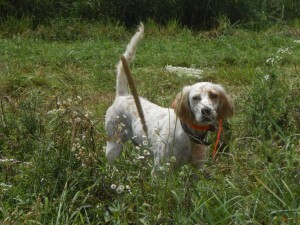 Northern Anndee (sister to our Grand National Grouse Ch. Body Guard) to RU Ch. Super Ghost. Super Ghost (Super B x multiple Ch. Star’s Misty Ghost) impressed us with his style, strong ground efforts and deadly bird handling with arresting style. Still winning at the age of 10, Ghost thrilled with his exciting way of going and style on point. Ghost is by Super B, winner of all of the ‘big three’ Puppy Classics–a beautiful, powerful, eye-catching nearly all-white dog was bred to PA Grouse Ch. Star’s Misty Ghost. Misty, owned by Rob Frame, came from our kennel and the mating of Wire X Buffalo Run Katie. This mating also produced PA Grouse Ch. Hard Rockin Kip. First, Patch is sired by Mountain Lane Silk, a son of RU Ch. Grouse Ridge Franc (Grouse Ridge Reroy x Grouse Ridge Frankey (she by highly respected Ch. Smoke Rise Buck). 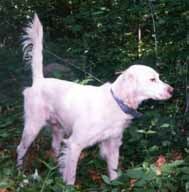 Silk was owned by Mark Lampkin, the breeder of Patches. There is a cadre of extremely serious grouse hunters in southwest PA, West Virginia and parts of Virginia. These are guys who hunt many days per week during the season and ring up big numbers of grouse each season. They have no time for a pottering dog, weak noses, heat intolerance or lack of stamina. They want efficient dogs and they insist on dogs who carry themselves and point with arresting style. These enthusiasts have bred to the best that the competitive cover dog world has produced over the years. Mountain Lane Silk met this criteria and Mark was prepared to venture into the competitive arena with him. Silk was placed with and trained by pro Dave Hughes. However, Silk contracted Lymes Disease and died at the age of two before realizing his high potential. Knowing that Silk did not have long to live, Mark Lampkin sought out the well-known cover dog breeder, Ohioan Kelly Shepard in search of a quality female to breed to Silk. Kelly provided the champion producer Thunderbird Gypsy to mate to Silk. Gypsy is by Ch. Long Gone George ex winner producer Northbound Pearly (she Ch. Grouse Ridge Reroy x fourteen-time winner Long Gone Giggles. Note: Full Blast’s dam is line bred to Grouse Ridge Reroy. Also there are two lines in his pedigree that track to Long Gone Kennels (LG George and LG Giggles (she by Stokely’s Diablo Ace). Lastly, one line on Full Blast’s dam’s side tracks to Stillmeadow Jim. These lines on the dam’s side (Grouse Ridge, Stillmeadow Jim and Long Gone) represent three of the four strongest lines in the past 30-year history of cover dogs. Ghost Train of which Pennstar is the most successful is the other historically great line. Weaving these three outcross lines with the Pennstar line explains the genetics of creating a fine dog like Full Blast. “Jeb’s” production to date (16-30-83) verifies the confidence we have in him as a sire. While his offspring are mostly still puppy and derby age, they have made an impact in trials and in the field across the gamut of cover dog territory. Full Blast pups have placed in numerous puppy and derby stakes of high calibre. With pup and derbies, it’s all about potential for greatness. In their numerous high quality wins such as at the Michigan Puppy Classic, the Bob Doran Puppy Classic, the Venango Puppy Classic, along with the historic feat of placing 1st, 3rd and 4th in the Grand National Grouse Puppy Classic the youngest offspring proved their potential. Then later in 2015 the derby wins started to accumulate. Too many really nice wins by Full Blast derbies have been recorded to keep track. However a highlight is Justin Evans’ Blast Away derby who won the 2015 Grand National Grouse Futurity following on the heels of Mike Spotts’ Full Throttle winning 2nd in the Grouse Futurity in 2014. Full Blast derbies have won Derby Classics in all the regions of the cover dog circuit. There is no question that Full Blast produces offspring much like himself–youngsters that have a strong desire to hunt and find birds, point and stand naturally and for a long time and do it all with class.